We recently came across a small magazine ad for an aggregate company. It’s the kind of “blurb” that most, if not all readers scan, think “isn’t that nice” and then continue to read through the magazine with a slightly warm fuzzy feeling in the back of their brain. But perhaps we should look a little closer at this situation to see what it really stands for, and what was deliberately left out. 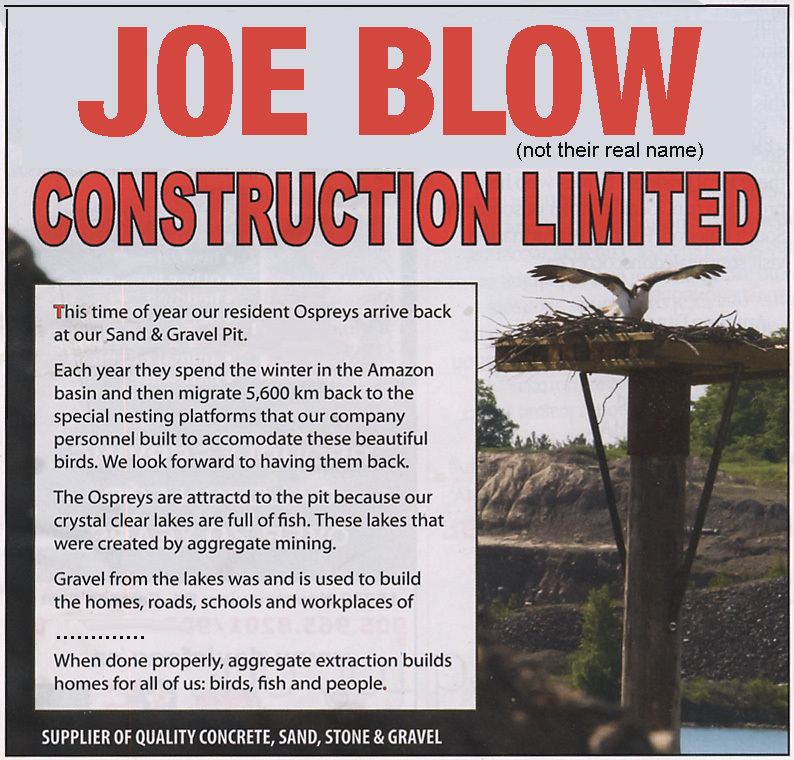 1) Do you think that that the employees at the open-pit mine site saw the Osprey circling in the air one day and decided that it would be “just peachy” if they built a platform to see if they could attract that wayward bird to nest on it? Or, do you believe that maybe this was the natural habitat for the Osprey that was obliterated by the gravel company when they decimated the land to make millions of dollars? Do you believe it was part of the MNR license agreement? Or do you believe it was done as a show of being a great corporate citizen? You decide. 2) Were there any other considerations given to the habitat of any other bird that may have been calling this area their home? You know, Blue Jays, Robins, Blue Birds, Swallows, Sparrows, and the list goes on… Or were they not part of the license agreement? 3) We’re not big fans of raccoons, but were there any provisions made for them? How about a fox? Maybe a porcupine? Squirrel? Chipmunk? Skunk? Deer? Pheasants? Did the oh-so-considerate operators build them any kind of accommodations, or just plough them under? 4) We really do believe it’s awesome that there are fish in the “lake” as it is called. But before it became a “lake” it was a “water table.” How many millions of gallons of fresh water is lost each year through evaporation due to the water table being exposed so gravel can be mined and the company can make as much money as possible in their operation? Did the company do any kind of studies to show what happens when hundreds of acres of water table are permanently disturbed? Is this exposure causing massive damage to the aquifer? We don’t see any of this in the ad. 5) And speaking of accommodations and “building homes for all of us”, how many residential properties do aggregate companies devalue in their quest for profits? How many homeowners have lost their life savings due to a pit or quarry moving in next to them? Why was that not part of the ‘feel good’ ad? Read the ad one more time … are you still feeling warm and fuzzy? Previous postRobin Hood, or Robbing the ‘Hood? True. Companies devote a lot of time and money on advertising, they know how to depict every fact in a positive light like this. Its just mass manipulation.